I had a hard time fitting all the info into my previous graphic poster, so I redid it today. 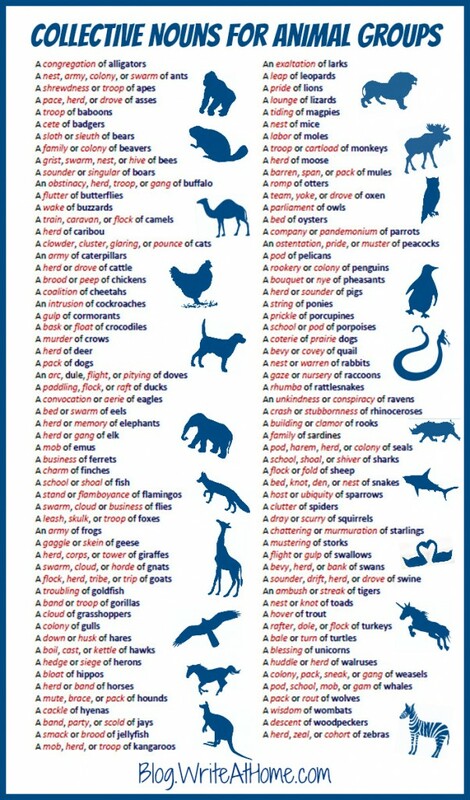 I also alphabetized it by animal instead of collective noun to make it easier to find the animal of your choice. This shortens the list too because I can give the various group names for each animal. Anyway, this took longer than I thought, so I hope folks like it. If you come to this page first, be sure to visit my previous post. I just love this stuff! Is there a way I can order a poster size print of this? Or can I get a release in order to have it enlarged and reprinted at a print shop? Thanks so much! Do you have a version of this that I could buy, or could you email one to print? Your poster is excellent. Sorry, Emily. I was getting most requests for print versions of my “Ways to Say” posters and invested my energies into those. I didn’t even think to create a print version of this one. I’ve been looking for such a poster as this – it’s great! Is it for sale? Thanks. It’s not for sale currently, but we are looking into print options. Love it! I would like to prince it for my son. Is there a printer friendly version? I came across it while trying to find what a group of crabs is called. He has much interest in this right now. I was just planning on creating a poster for this subject! So glad my co-worker turned me on to your site! Thank you for doing this, Brian! You and I share a passion – the desire to teach children how to write better. Keep up the marvelous work you are doing. I’m so glad you enjoy it, Laura!